The T-70M Soviet light tank was produced in large numbers in response to the German 1941 Operation Barbarossa, the invasion of Russia. 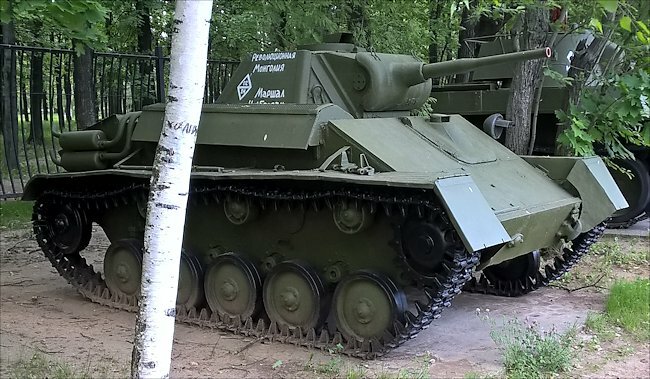 This restored tank can be found at the Central Museum of the Great Patriotic War 1941-1945, Pobedy Park, (Victory Park) Poklonnaya Gora, Moscow, Russia. T-70M Soviet WW2 Scout Tank can be found at the Central Museum of the Great Patriotic War 1941-1945, Pobedy Park, Moscow, Russia. You can tell it is a T-70M and not an early T-70 because it has a welded not conical turret. The Soviet T-70 light tank had improved armour and fire power when compared to its predecessor the T-60. It was still out classed by the German Panzer III and IV tanks and had no hope of penetrating their frontal armour. It was not designed to take on these bigger tanks in a tank-on-tank fight. This was a light tank whose role was to engage enemy infantry and soft skinned vehicles. Its other function was to act as a forward observation scout. Its low profile enabled its tank crews to sneak up to the front line or even behind enemy lines. Once camouflaged and concealed in a wood, farmhouse barn, hedgerow or behind a stone wall they could record enemy movements and then relay that information back to their Headquarters. Notice that the turret and the driver's position on this T-70M is on the right hand side of the tank. This was to make room for the engine compartment on the left. Sergeant Alexander Pegov of the 3rd Guards tank army was promoted to a lieutenant and decorated as a Hero of the Soviet Union for knocking out a new German Panther tank. He used bushes and trees to hide his position. He was in command of a single T-70 light Tank on a reconnaissance patrol. On 26th March 1944 he spotted a column of 18 German armoured vehicles moving down the road where he had set up his ambush. He knew he had no chance of knocking out the lead Panther tank at long range or on its frontal armour. He waited until the enemy tank was just under 200 meters away and he could fire on the vehicle's weaker 40 mm side side armour. He fired on the lead tank with an armour piercing APCR round and it caught fire. As it was blocking the road Pegov had time to fire at the following tank and immobilize that one before driving away at a full speed. 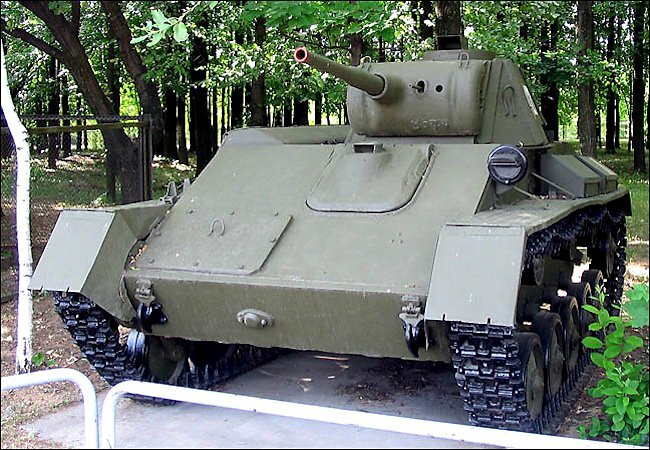 The T-70 tank had a 45 mm L/46 model 1938 main gun whereas the T-60 only had a 20 mm TNSh gun. It could carry 70 rounds of ammunition. The turret armour ranged between 35 mm - 50 mm which was an improvement on the 20mm armour on the T-60's turret. The front and rear armour protection on the T-70 was only increased by 10mm compared with the T-60. It now had 45mm on the front and 35 mm armour plating on the rear. The increase in weight from the T-60's 6.4 tonnes to the T-70's 10 tonnes meant that the tank designers had to fit a different propulsion system. The T-60's GAZ-202 76bhp single engine was not powerful enough. They fitted two GAZ-70-6000 70 bhp engines; one to power each track. Top road speeds were only a few kilometres better than the already sluggish T-60. The T-70 light tank had a cross country speed of 24 km/h and a top road speed of only 45 km/h (28mph) which when compared to the heavier Russian BT-7M tank's top road speed of 62 km/h was very poor. The Tank engineers used the same chassis as the T-60 tank but changed the drive from rear wheel to front wheel. Using existing chassis designs cut down on development time. The Red Army needed as many tanks on the battlefield as possible in the shortest time available as the country was under attack. In 1941-1942 these light tanks were a stop-gap answer to the lack of T34/76 medium Tanks and KV-1 heavy tanks that could take on the German Armoured units. They were far quicker to produce than their bigger brothers. Production started in March 1942 at the Zavod Factory Number 37 and finished in October 1943. Records show that 8,226 were produced during that period. The tank had a crew of two, driver and commander. Having a tank commander who had to load and fire the gun whilst keeping an eye out for threats, friendly troops and dangerous ground was problematic. He was over-stretched and this seriously affected the operational performance of these tanks in the heat of battle. The original conical turret was replaced by a welded turret in April 1942. It had a commander's periscope rather than just vision slits. The engine was improved. These upgraded T-70 tanks were technically referred to as the T-70M but were continued to be called T-70s in official reports. These were the most numerous versions of the T-70 light tank produced. Where can I find surviving T-70 Scout Tanks?